Model 5381 with RTSN100A3 transfer switch. 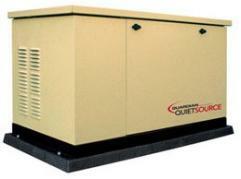 the starting amperage available for large items such as air conditioners or well pumps. is not a guarantee of service life but is an average based on many units in service. and bonded electrician install this product. This switch is mounted near your existing electrical service panel. Utility power is routed into the switch. generator. Switch does not contain any circuit breakers.